Bob is a giver. He is involved in many organizations helping people, pets and nature. He can be called on the help in almost any situation. He has a special interest in senior pets and often steps in to help our clients get through tough times when pets pass away. He has a compassionate heart and cares about people and their pets. 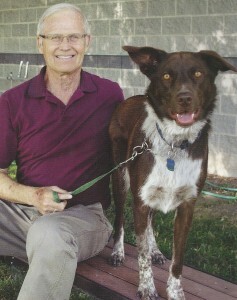 Bob is also involved in the Idaho Humane Society Inmate Dog Alliance Program of Idaho (IDAPI). He transports dogs to and from the prisons for training by the inmates. He also participates in the dog graduations and finds joy in seeing the graduating dogs go home with their adopters. His dog, Woody (shown in the photo) is a graduate of the program. Bob keeps active by walking dogs for us. He has great dog handling skills and dogs instantly like Bob. While dogs are admittedly Bob’s true love, he also enjoys caring for cats and other pets in his care.